Oregon senator speaks at Franklin High School in aftermath of latest mass shooting that leaves 12 dead in California. 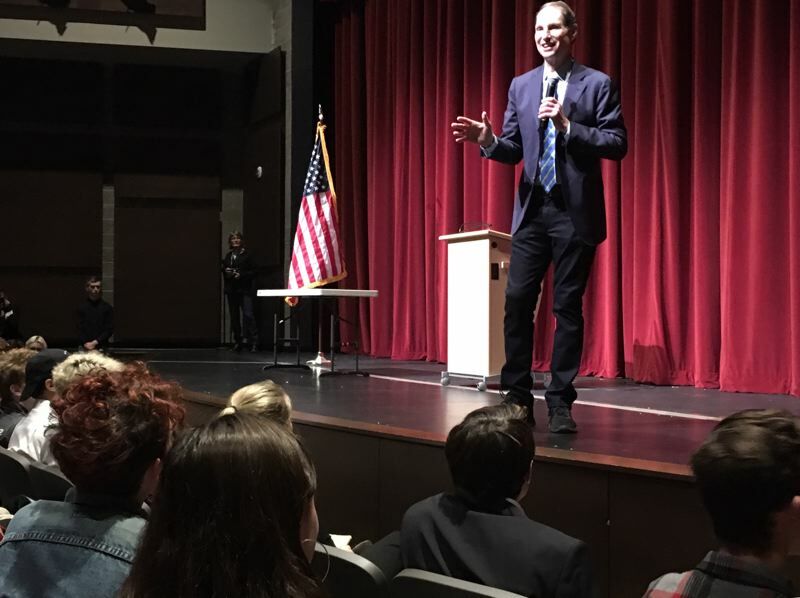 U.S. Sen. Ron Wyden says if Congress will not act on gun regulation, some of the future voters he talked with at a Portland high school should join others to generate popular momentum for it. The Oregon Democrat spoke Thursday at Franklin High School, just hours after a gunman killed 12 people — including a sheriff's sergeant — at a bar in Thousand Oaks, Calif., west of Los Angeles. "What we saw last night just a few hours ago is yet another tragedy, where once again, parents grieve and young people mourn," Wyden told a group of students, many of whom are on the school's Constitution Team. "My point is that next week, when the Senate comes back … how many more grieving parents and mourning young people do there have to be to have common-sense gun legislation to reduce gun violence on the floor of the United States Senate?" Wyden singled out by name Mitch McConnell, the Kentucky Republican who as majority leader controls when bills come to the full Senate for debate and vote. "Your generation is going to make the difference," Wyden said. 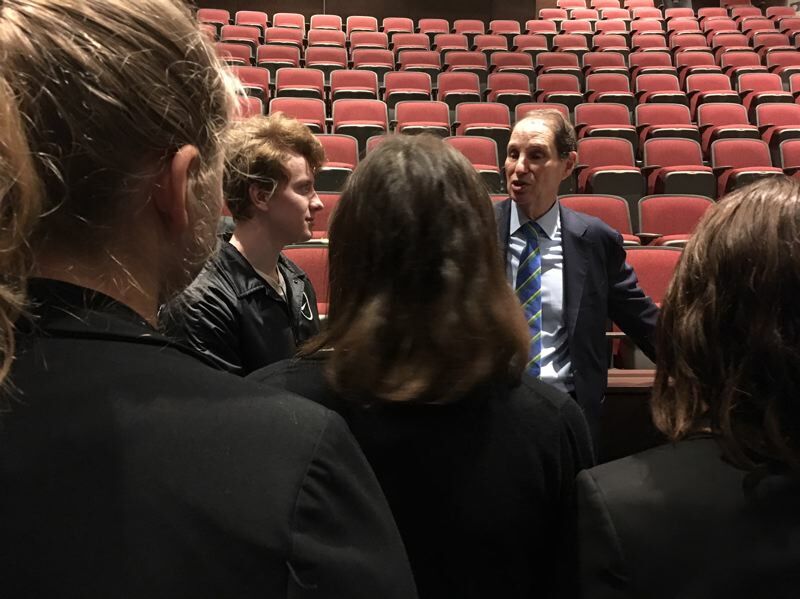 Franklin was the latest stop in Wyden's "Listening to the Future" tour of Oregon high schools. The tour is separate from Wyden's town hall meetings open to the public, although schools play host to many of those 910 meetings he has had since he was elected to the Senate in January 1996. Wyden did bring a Hood River Valley High School sophomore, Eva Jones, in March to Washington, D.C., to testify at a Senate Democratic hearing on gun violence. After a Feb. 14 shooting left 17 students and staff members dead at Marjory Stoneman Douglas High School in Parkland, Fla., Annika Mayne — then a junior — helped organize a student walkout at Franklin to coincide with a national event April 20. Mayne, now a senior, introduced Wyden at Thursday's gathering following remarks by Portland Superintendent Guadalupe Guerrero. "I think it's good to get senators into schools," Mayne said afterward. "I think democracy is often left out of education, so it's really important for students to be able to see that in school and not have to pay, but be at a free event — where they can interact with their legislators and see themselves represented in government." The Senate has taken votes in recent years on gun legislation, but most bills have failed to muster the 60 votes required to avert a filibuster. In 2013 — a few months after the 2012 shootings at Sandy Hook Elementary School in Newtown, Conn., that left 20 children and six adults dead — Wyden voted for but the Senate rejected bills to expand criminal background checks to gun-show and online purchases and ban assault weapons. The background-check bill got 54 votes. Similar stalemated votes occurred in the Senate after mass shootings in 2015, after 14 died in San Bernardino, Calif., and in 2016, after 49 died and 53 were injured at a nightclub in Orlando, Fla. In addition to expanded background checks, a second bill would have barred firearms sales to people on a federal terror-watch list. Before the election, Republicans held the narrowest of Senate majorities, 51 to 49, including two independents who caucus with Democrats. Democrats in the Senate are left in a weaker political position as a result of Tuesday's election, when three Democratic incumbents lost — and a fourth was trailing but a recount ordered — in states carried by Republican Donald Trump in 2016. The other six from states Trump won in the presidential campaign were re-elected. A Democrat did unseat a Republican senator in Nevada, and a seat being vacated by a Republican in Arizona is not yet decided. But Wyden said the Senate balance is still so close that it will take a bipartisan majority of 60 to pass any legislation. He also said that the House — which flipped Tuesday from a Republican to a Democratic majority for the first time in eight years — could help prod action on legislation and oversight of the Trump administration. "I believe we are going to have a stronger checks-and-balances program," he said.